Finding a great deal on a Chain Bit With Engraved Shanks can be difficult. 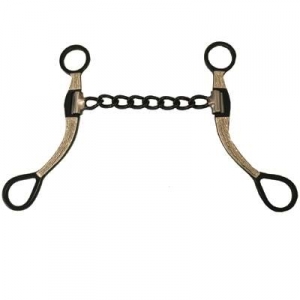 But do not worry as we have a vast selection of Horse Chain Bits that are not just made of superb quality but also affordable. This Chain Bit comes with engraved shanks that are made of silver with an antique look. So get yourself a nice set of Chain Bits today. When buying from us you can rest assured you will be purchasing a great product.